As aviation, travel grows more popular, both airlines and aviation companies are seeking to invent new ways to conserve energy. This applies to both civil aviation and air forces around the world. 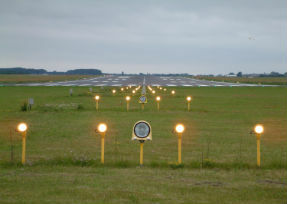 One such invention is the LED aviation obstacle lights. These lights play an important role in marking high rises to prevent accidents caused by aircraft flying into them. There have been a number of breakthroughs in aviation technology and aviation related technologies that are concerned with saving energy. One such innovation is the low intensity aviation obstacle lights used to mark out high-rise buildings. These bulbs are used in marine navigation, tele-communication towers and other high-rise structures. Obstacle lights are installed on any structure that is more than 45 meters above ground level. The LED lights emit light at 30 lux level at 1.5m. These aviation lights have an optical arrangement that allows the bulb to provide 360 degree illumination. These lights are water proof and are enclosed in an aluminum alloy casing. The design of these lights ensures that they can withstand all weather conditions. These lights are energy efficient and consume less than 7 watts. These lights utilize the latest LED technologies to produce low to medium intensity light. These lights are robust in design and are maintenance free, at the same time consuming just 10% of the energy that an incandescent bulb consumes. These bulbs are also designed to be powered by solar energy for stand alone operation in remote areas. These are an energy efficient solution combined with the low maintenance needs these are ideal for lighting up obstruction. Some aviation light manufacturers have integrated audio, visual alarms which enable maintenance teams to change lights when the need arises. The technology of LED lighting has found its way from industrial applications such as aviation lighting to everyday consumer use. These lights are more efficient than normal incandescent bulbs used at home and have a longer span. These bulbs can be color corrected to ensure that the ambient light produced is pleasing to the eye. With improved manufacturing techniques the cost of these LED lights are reducing.